When rainwater falls on a paved surface it needs to drain away or the water flows across the surface forming pools, adding to the flood risk and cracking. Conventional solid surfaces are impermeable but gravel surfaces avoid this problem as water flows freely through the small stones and into the ground, the downside to gravel is that it can be messy due to movement and difficult for pushchairs or wheelchairs. Resin bound paving combines the benefits of both solid and gravel surfaces. Resin bound systems create many small gaps that allow water to drain through into the ground. Specially formulated for resin bound installations of driveways, paths and patios, our 10kg kit can be mixed with 80-100kgs of specialist aggregate of 1-5mm, which are available from builders merchants, to create a surface as strong as concrete. A resin bound system will typically be laid at 15mm thick over an existing sub-base to create a firm surface. 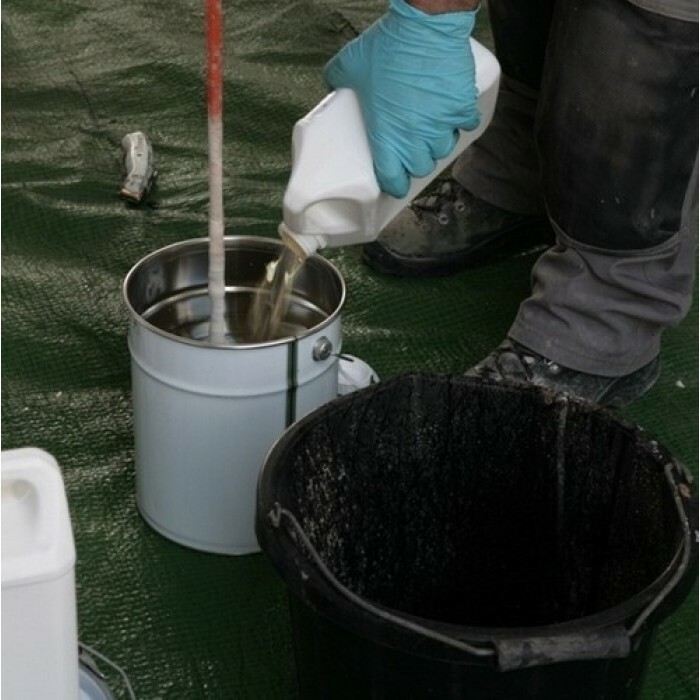 This product can also be used as a resin bonded sytem where the resin is applied to the substrate and the gravel is scattered across the surface. In all cases surfaces should be clean, dry, sound and free from any oil or contaminants. The gravel should also be completely dry before being mixed with the resin. Stir the resin and hardener individually and then combine the resin and hardener and mix for 3-5 minutes using an electric drill and mixing paddle, or wide bladed tool. Ensure you work around the sides and base so all liquid is incorporated to ensure thorough and complete mixing. Best results are obtained in ambient temperatures (15°C or above). Resin Bound – Add the gravel and mixed resin at a ratio of 1 part mixed material to 8 parts gravel in a mechanical mixer for 3-5 minutes. When fully mixed empty the contents into a barrow and apply to the area. Rake, tamp and trowel smooth as required. 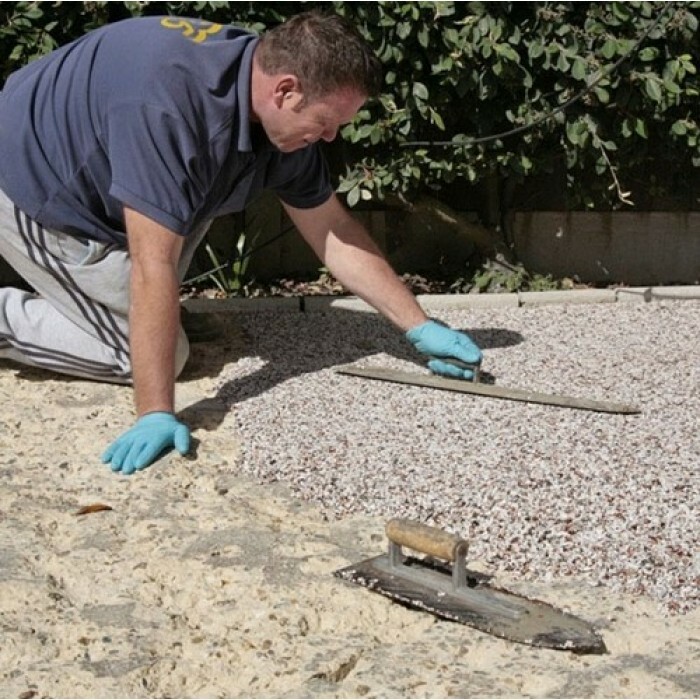 Resin Bonded – Spread a layer of resin to a suitable surface and cover with loose aggregate. 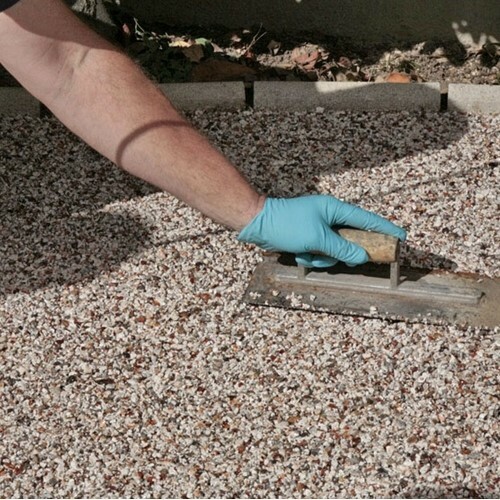 Once cured the remaining loose stones can be removed by sweeping the surface. Thickness is governed by aggregate size i.e. 1-3mm aggregate will have a nominal depth of ~4mm. With resin bonded gravel surfaces it is important that proper drainage is installed to prevent flooding. Please read the Technical Data Sheet below.